Editor’s note: The following was written by Angela Ramage, former TFC trustee and alumni board member. When I stepped up to the window of the old dining hall to take this photo I was not expecting to feel anything other than the need to photograph the fireplace before the wrecking ball hit. Soon the old dining hall and the two add-on buildings beside it will be gone. At that moment, only the afternoon light was slightly drifting through the windows. But suddenly before I could lift my camera, the entire room was aglow with light from the setting sun. It was beautiful and I was touched. Someone had placed a simple vase of flowers on the mantle. How fitting, I thought. Evelyn Forrest would have liked that very much, and I think Richard Forrest would have smiled at the idea as well. Then he may have mused: It’s over; it’s gone, and there is no way to return to an earlier time. Nothing is behind us now. We only have what lies before us, but we have memories. Oh, my, do we have memories. This section of the building was the oldest structure on the campus. I don’t think there is anything older still standing and certainly nothing more meaningful. 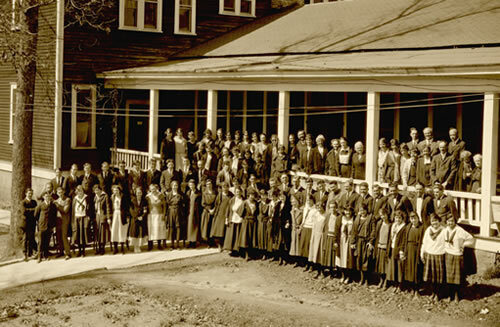 It is the place where Toccoa Falls College was fully committed to God’s work. After the fire in 1913, Richard Forrest was solely tempted to give up the ministry at this location. Thinking about it, I would have been tempted to do the same. He was in his mid-twenties and in some ways had already lived a lifetime. He personally knew A. B. Simpson the well-known Presbyterian minister turned founder of The Christian & Missionary Alliance denomination. He also would have known others who were tremendous spiritual leaders and some who had roots in the Keswick revival movement in England. His spiritual heritage was rich. At Simpson’s request, he and his wife Evelyn had become “home missionaries” and the results were dynamic. They had founded 14 Bible study groups in Florida that later became churches including the big one: First Alliance in Orlando and a small one in Punta Gora, Florida. Then Simpson turned his sights on Atlanta and asked the Forrests to help with the work there. 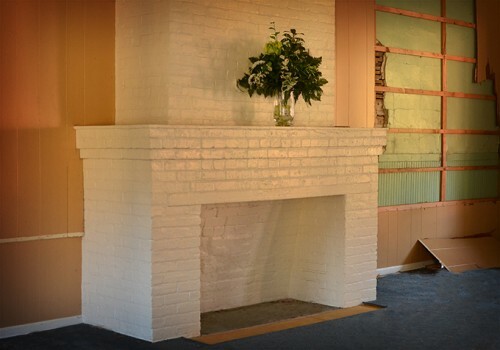 They lived on Lucky Street downtown and cooked their meals over an open fireplace. The Forrests did not know it, but it was preparation for what would come later. Once again their ministry flourished and soon there was an even greater challenge placed before them—start a school for mountain children, who had no means of getting a formal education. Years ago, the Rev. Jack McLaughlin, who was the pastor of the Punta Gorda church and later alumni director at TFC, put me in touch with Evelyn’s niece, who was living in the area. I remained friends with her up until her death. Over the years, she told me so much about the Forrests. There was always music in their house and in this building. People played pianos, sang, and laughed. Before she fell and broke her hip, Evelyn had been quite an active woman. She loved to make people laugh and always gathered many around her dinner table to eat. Once, as a joke, she even served turtle caught in the pond to her guests. She taught weekly Bible studies in Atlanta, Greenville, and Asheville while also teaching classes at the school. On top of this, she was one of the first women to teach the Bible on the radio! Her schedule was booked, but she always managed to have time for family and friends. I also learned fun facts about the lives of those who lived at Toccoa Falls during those early years and silly things about the land. Evelyn’s niece often took a map of the school and showed me where landmarks were located—Indian Springs, the old lumber mill, and Little Falls that had been named Glenn Falls after a small stream in Appleton in Cecil County, Maryland, where Evelyn had grown up. “Oh, yes,” she once confided. “Times were so hard. The folks had nothing, and everyone had to pitch in. Many wondered if Uncle Richard would give up but he didn’t.” We know for weeks after the fire, he searched for answers to his many questions. Most of us have done this same thing. We would have wandered around hoping that some divine answer would fall out of the sky in the form of a personal letter from God. In a way this is what happened. Digging in the smoldering ashes of Haddock Inn, God reminded him of His promise in Isaiah: There would be beauty for ashes (Isaiah 61:3). From ashes was where the Forrests had to start. Honestly, they were physically alone in a remote area of northeast Georgia. That had to be overwhelming to a young couple. It probably seemed that their dreams had gone up in smoke. There was no money, no food, no way of escape, no immediate hope, and few friends. Finally confronted by Sarah Staley, the turning point came. She reminded Richard that they had been “called by God,” and the work had to continue. She was a school teacher so I often wonder just how big the period was at the end of her sentence. It must have been fairly large because Richard accepted what was probably the most difficult challenge of his life. The book Achieving The Impossible with God tells us that he walked out the door of Sarah’s cottage and went out to a shed and grabbed an old brier hook and then headed up the hill to the very place where I was standing. It was and still is Holy ground. I thought for a moment and realized that it is in the crucible of disappointment and immense loss that hope is born. A brier hook was all Richard had, but he began to clear the land for a new dining hall. And with each swing of that tool, a portion of doubt and fear fell away. Soon others joined him. They had caught his vision, his passion, and his dream—God’s dream. But it was a dream that would not become reality without extreme sacrifice and, at times, sorrow— two of the very ingredients of a strong and abiding faith. After a space large enough for the building had been cleared, the Forrests and those with them went down on their knees and prayed and committed that land to the Lord for His service. I don’t think there is a way to count the number of decisions that have been made for Christ on this holy and committed ground. In this simple and very crude building, thousands have surrendered theirs lives to the Lord—the same way Richard did. 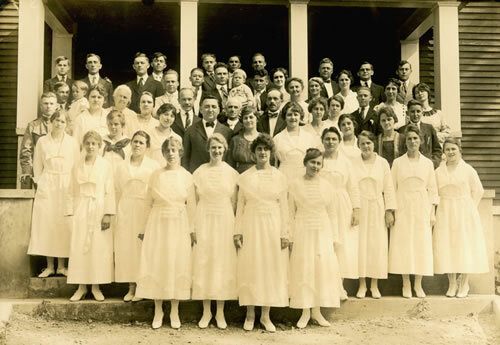 My own mother while visiting Toccoa Falls told me that there was something so different about the school. And she said this to me while we were standing at the chapel. Later, that same day, she prayed to receive Christ as her Savior. Memories—there are too many to recount. 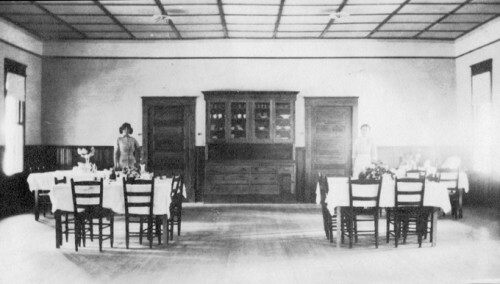 The school’s family gathered for meals in front of the chapel’s fireplace. They would have celebrated birthdays here along with Christmas and Thanksgiving. In the winter, the fireplace would have been ablaze with a fire that had been started with fat pine and kept going strong with native hardwood. The Spirit of God is a mighty rushing wind, but when there are no funds to save or to restore, old buildings go away. Nothing, however, can erase what happened within these simple lath and plastered walls or on the ground, which this building sits. And if you look at this photograph of the fireplace and close your eyes for a moment, I believe you will hear the sounds of people coming and going—talking and laughing and studying for classes so they could make a difference in our world. You also would hear a dinner bell ringing and you would see china plates lined up on long tables with tablecloths where people ate together at least three times a day. Rather than live comfortably on the hill with Sarah Staley, the Forrests chose to live a few yards from here in the board shack. They wanted to be near this place and the students, who after the Haddock Inn fire were living in nearby tents. So, I had to ask myself: What is in this beat up, no account, and mold-ridden, building? Not too much for human eye consumption, but it is different for spiritual eyes. They see the omnipotent hand of God and remember and vow never to forget.